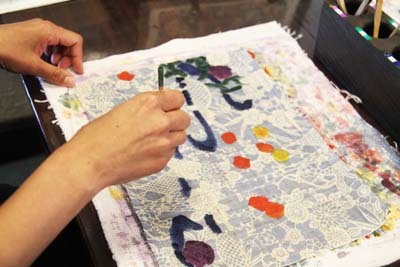 A staff member prepares a coral stamp for making a unique piece of fabric, a T-shirt or tote bag. Shuri Ryusen is a facility near Shuri Castle that has been in business since 1973. The facility is the leading purveyor of original Okinawa fabrics dyed to perfection with natural plant dyes. The Shuri Ryusen building was originally designed to house an institute to develop dyes and fabrics. Shuri Ryusen is located on the site where a residence of one of the Shuri court’s top three holy princesses used to stand. Koto Yamaoka designed the building as a research institute to develop quality dyes for fabrics, and it stands by the remains of the Chuzan Gate, a main entrance to the Shuri Castle just up the road. Yamaoka’s daughter Hiromi Oshiro, who has taken the business to the next level, is now using the powerful dyes Yamaoka developed in the institute, creating fabrics and products. Yamaoka created a unique niche for the company with his distinct, trademarked products linked to coral. In over forty years after Shuri Ryusen was established, the facility has becopme very popular with visitors. Bingata textiles for kimonos hang from the third floor ceiling ready for customers to pick one for their unique Okinawan garment. Coral dying uses natural pigments and applies them to T-shirts and other products with stamps made of coral. 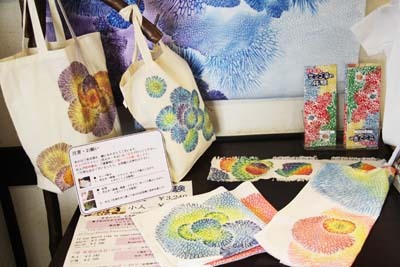 The blues, greens, violets and yellows are stamped on fabrics with varying size coral stamps, creating unique designs only available at Shuri Ryusen. The environmental rules concerning coral now prohibit taking it from the sea, but Oshiro’s coral heads used in fabric stamping date back to 40 years and more, long before restrictions were put in place. A mask for bingata dyeing is all work done by hand. Kimonos are a specialty that takes plenty of time from start to finish. 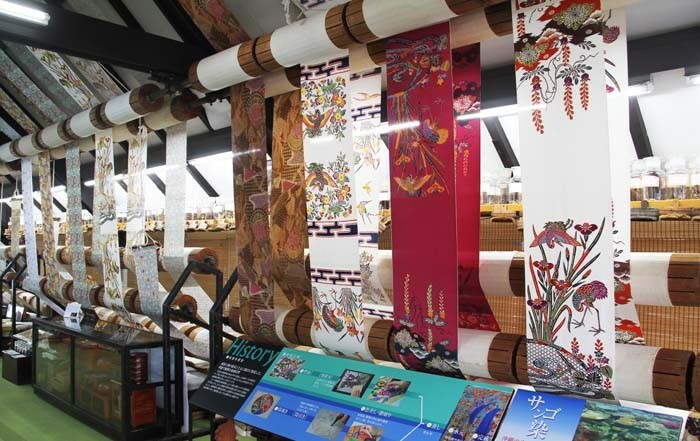 The bingata fabric is woven at Shuri Ryusen in a three-month process to create a 13-meter-long product used in the kimono. In cases of intricate designs, the three-month process could stretch to four or even five months. A customer can choose from a variety of materials ranging from cotton to China grass, bashofu, a woven fabric made from Japanese fiber bananas, and silk, for exactly the kimono she’d like. Creating a kimono—or Kariyushi-shirt, for that matter—is a handmade process. Stencil cutting papers are meticulously cut to the pattern desired, then a series of them—one for each color being used—are used to mark the fabric with shaded patterns. Botanical dyes are used exclusively to insure the highest quality possible. In addition to textiles, Shuri Ryusen has plenty of other merchandise for sale. Shuri Ryusen is much more than simply a store; it’s an educational and fun experience. Visitors and potential customers can wander the three floors of the facility, and most begin on the third floor, where the coral stamping is done for shirts and other products. It’s also the place where the fabric selection process begins for a garment. The second floor at Shuri Ryusen is a mix of the past and the present. There is a blended museum and sales outlet for Okinawan and Japanese artifacts. Lacquerware and pottery, together with antique Japanese carvings and oil paintings, are available for purchase. Also on the second floor is an exhibit depicting how a high-ranking princess in the Ryukyu Kingdom probably lived, an insight into the history and culture in the Kingdom’s old capital Shuri. Merchandise decorated with coral dyeing on sale at Shuri Ryusen. 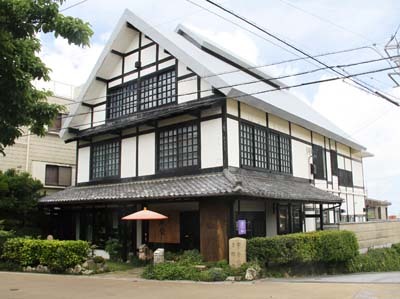 Shuri Ryusen’s first floor houses a traditional sales showroom, complete with a seating area where the staff takes time to serve customers Okinawan tea and sweets. 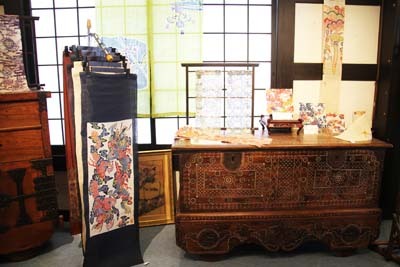 There you’ll find kimonos, coral-dyed and bingata-dyed fabrics and finished goods, hand stamped coral pattern silk scarves, and even small souvenirs. 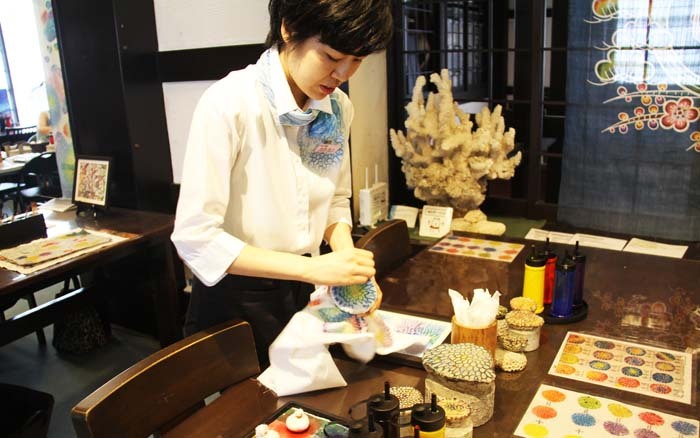 A fun part of a visit to Shuri Ryusen is an opportunity to “do it yourself” with the coral dye stamping process. Make your own tee shirt, apron, summer shirt or even a tote bag, sitting down the set of more than a dozen different coral stamps to create an individualized product. It only takes 30-40 minutes, and is inexpensive. To create an adult tee shirt or bag, it costs only ¥3,240 and that includes all materials and tax. For elementary school age children, the cost is ¥2,700. And after you make it, and you take it home with you. 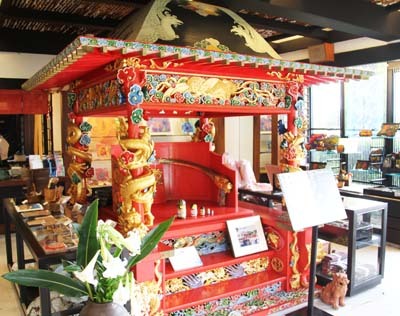 A replica of a royal Ryukyu palanquin greets the visitor on the first floor. Shuri Ryusen is open seven days a week, 09;00~18:00, the hands-on experiences end an hour earlier. The bingata store accepts Japanese yen and credit cards. Reservations for experience classes are advised and can be made at (098) 886-1131. 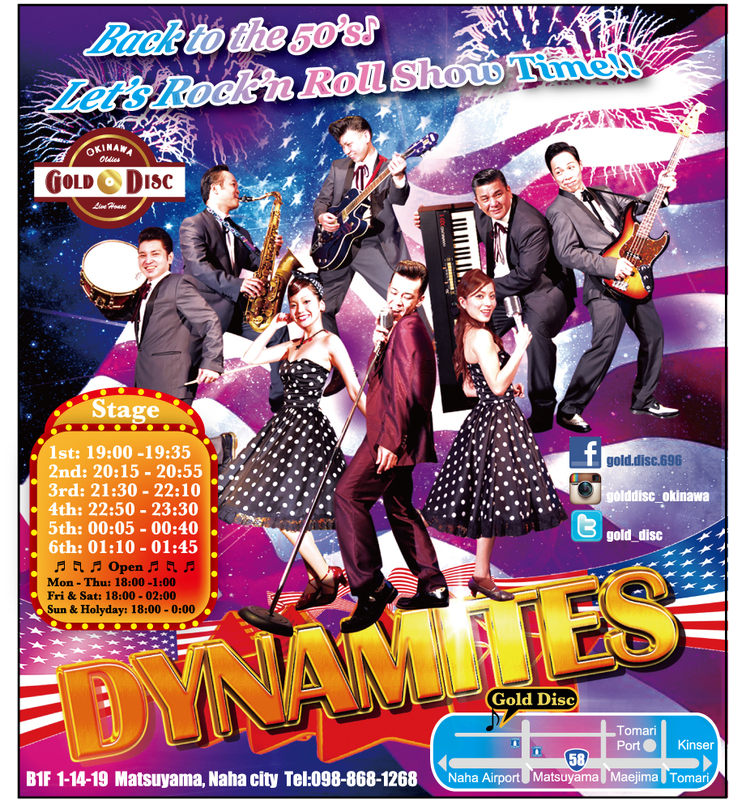 For more information, visit Shuri Ryukyu English language website. Shuri Ryusen is located at 1-54 Yamakawa-cho in Naha City. To get there take Hwy 330 to Naha and turn left to Shuri at Asato intersection. Continue all the way up the hill passing Nikko Grand Castle Hotel on the left. At the traffic light take right and then right again at the next light. One more right at the first major intersection and Shuri Ryusen is on the right about 100 meters from the intersection. Free parking for a few cars is across the street.